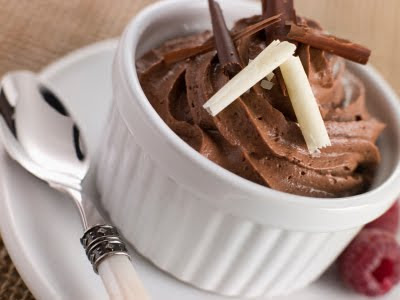 A READER from South Africa asks for an economical chocolate mousse recipe. It's hard to know which of the usual chocolate mousse ingredients are expensive in other countries: Is it butter? Cream? Chocolate? Sugar? Eggs? Vanilla? It just so happens that my favorite chocolate mousse recipe (which is different from the one in my chocolate mousse cake – though you could certainly use it there) calls for no cream and no butter, and that's just about as economical as you can get, at least on this continent. As far as equipment is concerned, if you don't have an electric mixer, a whisk will certainly do. And not only that, but it's absolutely delicious, and it's the one I served in all my restaurants, in little pots. In my San Miguel de Allende (Mexico) restaurant, we used to put a surprise in the bottom – a chocolate-covered coffee bean, maybe, or a mint chocolate candy, or just a small chunk of chocolate. We also played with different liqueurs. Both the liqueur and the surprise changed every week. MELT chocolate in top of double boiler; add coffee or booze, stir, add vanilla. Don't stir too much. Set aside to cool to room temperature. SEPARATE the eggs, putting the yolks in the top of a double boiler or a bowl that fits over a pot with hot water in it. The whites go in a squeaky clean bowl, or in the mixer bowl, for whipping. MOVE yolk-sugar mixture to an ice bath (a larger bowl with ice cubes and water in it), and stir until cool and thick. ADD chocolate mixture to yolk mixture, stir well. Make sure it's cool before proceeding with the next step. BEAT the egg whites until stiff, adding the 1 TB of sugar about halfway through. STIR 1/4 of the egg whites into the chocolate mixture to loosen it, then gradually fold in the rest of the egg whites with a spatula, in 5 or 6 batches. SPOON or pipe into individual pots or into one beautiful serving bowl. SERVE decorated with a dot of whipped cream, an edible flower, a sprig of mint, a dusting of icing sugar – or nothing at all. REFRIGERATE for at least 3 hours, and preferably overnight. * Some of the liqueurs we have used include: coffee, orange, mint or chocolate; but a shot of very strong coffee works just as well.